Recently, it has become fashionable for Caribbean achievers to write memoirs. I applaud this trend. So much distorted and often jaundiced material has been written about Caribbean countries, their history and events by persons from outside the region that a book, reflecting on life in the region by a Caribbean person is a most welcome development. Such books bring a more intimate view and authentic perspective of the region and its peoples. 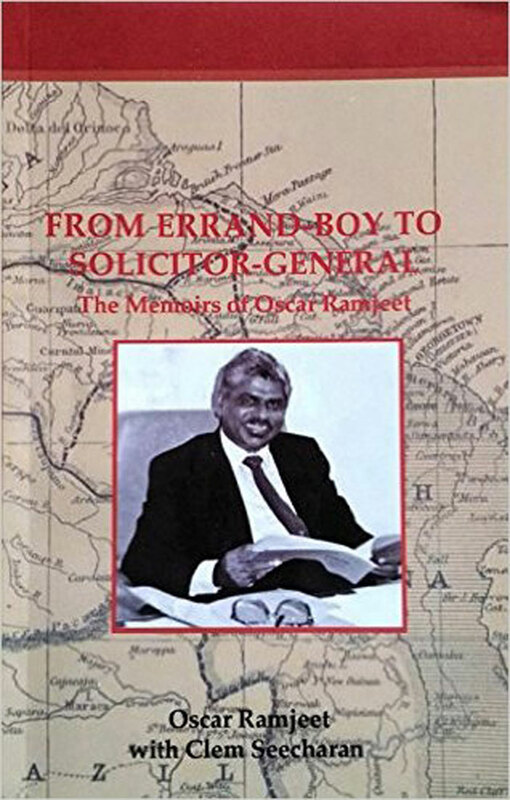 Oscar Ramjeet’s “From Errand boy to Solicitor-General” is remarkable for its broad sweep through the Caribbean – from Guyana in the South to the US Virgin Islands in the North. It is peppered with the politics and the personalities in each of them, as experienced up-close by a consummate chronicler of events. Ramjeet gives a vivid, educative and entertaining account of growing up in colonial British Guiana (now Guyana) and his subsequent experiences in other Caribbean countries, including St Vincent and the Grenadines and Belize where he served as Solicitor-General. A few gems of Guyanese life are revealed in Ramjeet’s account of his early life in a poor Indo-Guyanese family, including the ambition that their children should do better. His mother’s weeping when, at the age of eleven, he brought home his first pay packet from working in a saw mill was anything but joyful. She lamented the circumstances of her son’s child labour. But, then there was his father, a self-taught accounts clerk who got him a job, at the age of 12, as an errand boy in a leading law firm because he wanted his son to be a lawyer one day. Ramjeet’s father did not live to see him satisfy that ambition. In the lawyer’s office, Ramjeet encountered what appeared to be a miraculous instrument – a typewriter. Ramjeet taught himself to type – a skill that he used to good advantage when he later launched into journalism, a passion that he never abandoned even though he went on to a career in the law in several countries. The racial tension between Guyanese of Indian and African descent was also a backdrop to Ramjeet’s experience but one which he eschewed for its ignorance and backwardness. Thus, he joined a Lodge, called the Mechanics, at the age of 21. He was the only non-African member, evincing the comment from his Indian compatriots, ‘Look nuh, Oscar in de lodge wid de black people dem’. Education and practise of the law were Ramjeet’s two ambitions that he pursued single-mindedly. In his quest of the latter he secured a job as an ‘errand boy’ in a law firm of great note in Guyana. Two of its members – Forbes Burnham and Desmond Hoyte – became heads of state. He rose eventually to the positon of clerk. He combined this latter task with free-lance journalism for both radio and newspapers, becoming a well-known name throughout Guyana. I encountered him myself in those day when I was a very young general manager of the national radio station and he was an older but accomplished broadcaster and writer. He brought to his reporting the same depth of research and quality of narration that are obvious in his book. Forbes Burnham, the first Prime Minister and first Executive President of Guyana remains a figure of great fascination to historians, politicians, academics and lawyers throughout the English-speaking Caribbean. Ramjeet devotes an entire chapter of his book to Burnham who he first met as a teenager and in whose law firm he worked as a clerk. For anyone seeking an insight into Burnham as a lawyer and politician, Ramjeet provides a first-hand view. One senses that while he is critical of Burnham, particularly in the final years of his regime, Ramjeet harbours a deep admiration – even affection – for the late Guyanese leader. In the event, the chapter is a candid narration of a close-up relationship with Burnham who seemed always to be kind. That kindness extended even when the Guyanese President became offended by a broadcast Ramjeet made that was critical of the government. Like many other West Indians, Ramjeet became a convinced Caribbean regionalist while studying for his law degree at the University of the West Indies (UWI). He says of that period, “My soul was becoming genuinely West Indian. I met and befriended many Trinidadians, Jamaicans, Barbadians, and students from the smaller Caribbean islands”. Among the many friends he made at the UWI were persons who became lawyers and political leaders in several Caribbean countries. Ramjeet provides an interesting narrative of the fortune and fate of many of them, as well as the ambitions that motivated them. He recalls, for instance, a rivalry between Vincent Teekah, later a minister in the Burnham government, and Herbert Volney, who became an ill-fated Minister of Justice in the Kamla Persad-Bissessar government in Trinidad and Tobago, over who would first address the United Nations. This chapter provides an understanding of the UWI’s central role in creating the importance of regional integration in the development of a Caribbean society. 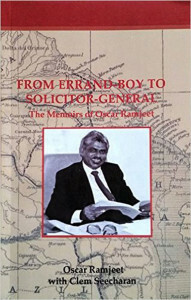 Ramjeet went on to become Registrar of the Supreme Court and Registrar of Companies in Montserrat and then Solicitor-General in St Vincent and the Grenadines and Belize. He also worked in private practice in the British Virgin Islands with one of the region’s great legal luminaries, Dr Joseph Archibald, who emerges in this memoir in the highest estimation of Ramjeet. His experiences in these Caribbean countries are written in the vein of pure theatre. There are candid accounts of court cases and the behaviour of lawyers and judges that are humorous but with serious over tones. Even if the reader is not familiar with the characters and countries of these dramas, the narrative makes fascinating reading. They also provide an insight into the politics of the islands and the leaders who bestride them. In his varied careers, Ramjeet was also a Cricket administrator and knew well the Indo-Guyanese cricketers who came from Berbice, the area of Guyana where he was also born. He writes of cricket stars such as Rohan Kanhai, Alvin Kallicharran, Joe Solomon with an intimacy born of his deep involvement with their careers. The overarching quality of this 352 page memoir published by The Caribbean Press is its no-holds-barred style and content. For sure, there will be many persons – dead and alive – that will not like Ramjeet’s book and would prefer it had not been published. He has displayed remarkable courage in telling the stories as he saw them. He pulls no punches even about himself, particularly his philandering. The book is written simply and engagingly. Its absolute frankness gives it great appeal. Historians, students of Caribbean law, and journalists will all find it a very interesting read.